All pupils the three week healthy eating challenge is on! 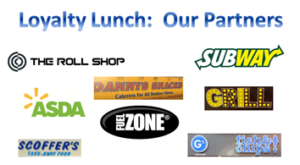 Show your card to any of the places show above when you purchase a healthy lunch. Your card will be stamped. 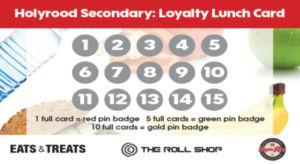 Collect 15 stamps to win a badge and return to the school office with your name on or Miss Divers in Home Economics. The first person to collect 15 stamps will win a cinema voucher Good Luck.